We are very grateful for the ongoing support of Connie's Gang ... a group of people who have supported us now for two years and in that time have raised in excess of £5000 for us. 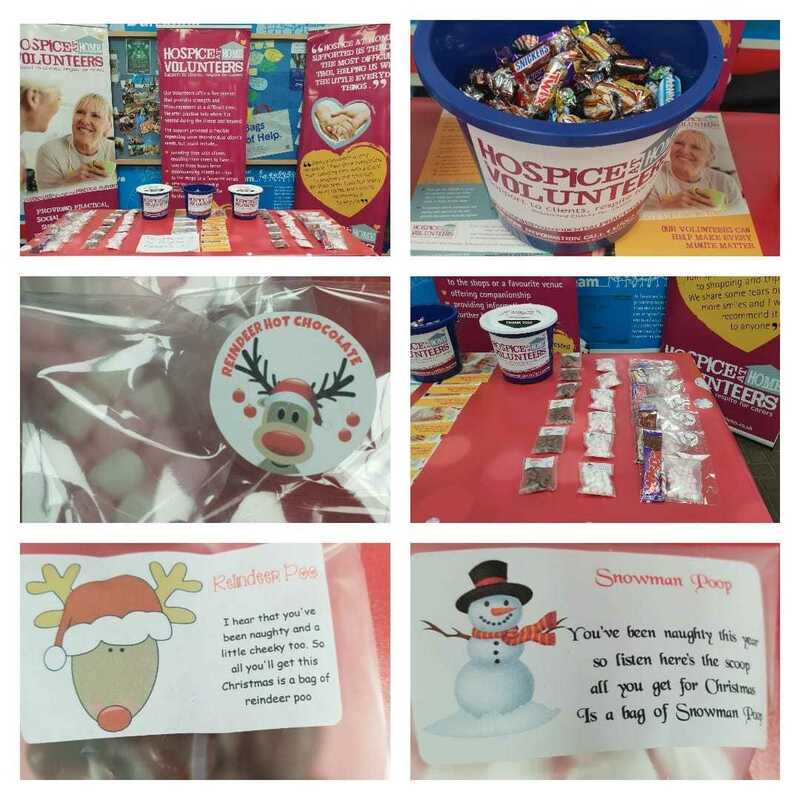 Today they are at it again in Tesco in Dunstable collecting money for us ..thank you to ladies n gents, particular thank you to Helen and Liz for providing the incentives of Snowman Poop and Reindeer Poo.. not forgetting the Hot Chocolate and Cookies... they will be there till 4pm so please do support them if you are in the area today. We are really grateful for the ongoing support of The Grove Theatre and Evolution Pantomines. We were once again chosen as their retiring charity at the end of each performance during December. 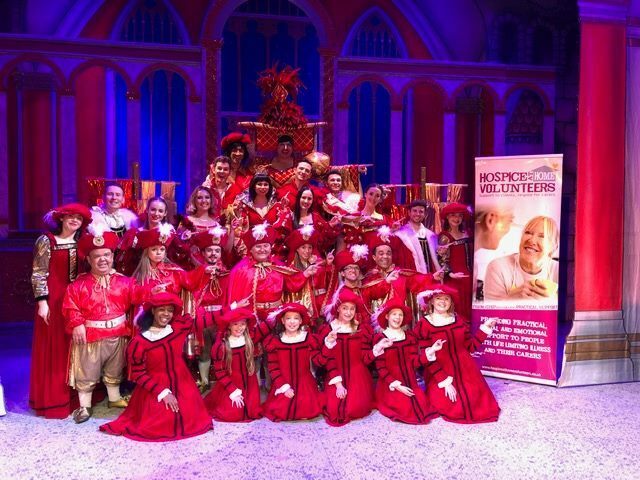 Not only did they put on a stunning panto but they raised a whopping £7711.42!!! We would like to say a MASSIVE THANK to all evolved, your support will enable our charity to continue to train and support our volunteers over the next 12 months as we visit our patients in their own homes. Over Christmas and New Year our volunteers continued to visit our patients homes and spent time with them and their families. One of our volunteers was able to help a patient write their Christmas cards to their direct family members - something they thought they would not be able to do this year as they had become so unwell. They were also able to help wrap up a few presents they had purchased earlier in the year. Just this small gesture meant a lot to the patient and their family. One volunteer took a short walk with one of the patients, the first time they had been out since finishing their treatment in November, stopping off for a cup of tea at a cafe. The patient, although tired once home, was so grateful for this opportunity as he has no family living close by and cannot go out alone. Another volunteer enjoyed a game of scrabble...while another sat and chatted with a patient whilst their carer went to the hairdressers. Our volunteers do a wide variety of activities whilst visiting patients in their homes; whatever it is they do makes a huge difference to our patients lives. Do you have a couple of hours a week you could spare to volunteer and a make a difference? If your interested in becoming a volunteer, or know someone who may benefit from our volunteers visiting please message the page and we will contact you. The Annual General Meeting will take place at 7pm on Monday 4th July 2016 in the Council Chamber Grove House, High Street North, Dunstable, LU6 1NF. Councillor Jones visited our head office within the Disability Resource centre where he met with volunteers. The retiring Mayor, councillor David Jones was delighted to hand over a cheque for £1,000 to Maureen Kerr of Hospice at Home volunteers on Wednesday 15 May. Asda in Dunstable selected HHV to be one of the three charities for consideration by their customers the for their ‘Community Life donation’.